The comprehensive SAP competence of each Plaut consultant comes into effect within the frame of consulting and implementation projects around SAP software products. The strength lies in both conception and implementation of user friendly software and IT solutions. The close partnership with SAP and the variety of realised projects are marks of Plaut’s SAP consulting. For more than 30 years and with more than 2.500 realised projects Plaut is one of the most successful partners of SAP. With the applications of SAP Business Suite, you can make your business processes more transparent and through consistent company data you can create the foundation for simpler and better decisions. By linking your operative business processes directly with strategic management decisions, plans, budgets and operative reports can be created an equalised cross-departmentally for all business processes. Consistent, company-wide unified processes are achieved with the applications of SAP Business Suite. Business processes and IT securely interlock and win in efficiency. The applications simplify the cooperation between employees and the collaboration with suppliers, distribution and trading partners and customers. The applications of SAP Business Suite are service-capable. That means that you can add new or adapt existing functions within short time and with a manageable effort. Times of extensive upgrades are over now - this is possible through the enhancement packages of SAP: nearly without interruption of business operations you can push innovation and growth. You can link functions with new processes and strike a new path. Every company is subject to constant change and should constantly improve its processes. The prerequisite for this is a well-maintained system. The optimal integration of the various services around these requirements is an essential goal of the Plaut IT services. Well-established SAP systems guarantee a high level of functional reliability and tried-and-tested standard processes. In many cases, SAP users already have detailed "know-how" in the ERP core area and for normal SAP application operation. However, questions about application problems, interfaces, interfacing with external systems, permissions, forms and evaluations can not always be easily answered. This binds time and energy of the service providers in the company. The spectrum of SAP application support services ranges from the support of SAP applications to the development of support processes that meet the specific needs of the customer (for example ISO 20000 or ITIL). While application support has a reactive nature, in the area of application maintenance many of the processes are proactively understood, e.g. SAPEarly Watch Alert, checking of SAP Notes and new Support Packages as well as Service Level Reporting. Added to this is the "operation of the SAP application" with interface management, transport, the import of support packages, user administration, batch job management and upgrades. Our application consulting services round off our SAP service offering in Application Management. Plaut serves the demands of the market arising from the new possibilities by a collection of services, which are provided meaningfully and economically "remotely". As a result, our customers save significant costs and can concentrate on their core business. This provides remote support to solve daily problems reported by SAP users. As part of SAP Application Support, it is possible to carry out development work within the SAP system (configuration and development work). SAP Application Support is offered by a dedicated team of consultants; We assure compliance with the agreed SLA conditions. A dedicated Internet application enables you to receive and analyze all application support requests. EasyBuero is a cloud-enabled enterprise portal developed by Stage4us. The web-based solution gives you access at all time, regardless of time and location. EasyBuero is available both as a cloud version and as a variant with its own server in the company. For more information, visit the EasyBuero website. Plaut offers a personal, professional service for all aspects of application management. These include Application Support, Application Maintenance and Application Consulting. The care is provided by specially trained professionals with consulting experience. The goal is comprehensive user support and the continuous development of the SAP system. In addition to the speedy elimination of errors in SAP standard programs, customer-specific applications or interfaces, customizing and programming work are carried out if required. As part of the SAP software maintenance contract, Plaut will provide first-level support for problems with SAP standard applications. The Plaut Customer Competence Center is certified by SAP as a Customer Center of Expertise. The Plaut Data Center has been audited by SAP and has been certified as an SAP Hosting Partner since 2002. For hosting we provide the complete SAP system in our data centers. The SAP users access via remote lines. We also look after the SAP system at our local customers and assume responsibility for operations here. We support customers who wish to operate the SAP system themselves within the scope of second level support agreements. In addition, our specially trained consultants provide support for challenging SAP base projects. These include: SAP release changes, database changes and UNICODE migrations. Plaut IT Services uses a state-of-the-art service infrastructure for efficient, customer-oriented support services in accordance with ITIL guidelines. The ongoing error and problem processing in incident, problem and change management is ensured by a ticket system. Our highly qualified support staff can respond to inquiries and requests individually to our customers and actively point out expected problems and errors. With monitoring and monitoring systems, e.g. SAP Solution Manager and system checks are guaranteed proactive support. Many companies with complex SAP system landscapes complain about lack of system transparency. The gap between the possibilities of the system and the performance requirements in terms of integrability and cost-effectiveness is growing steadily. Increasing discrepancies arise between implemented and used functionality. System changes during IT projects thus become incalculable risks in terms of cost and time management. Another aspect in the management of heterogeneous systems is the harmonization between template and roll-out systems to balance standard and individual development in a healthy balance. We as Plaut offer with PASA a cross-system tool, with which our customers can realize the basic principle of an effective SAP system world and that with optimal cost-benefit relation with minimum binding of internal resources. PASA brings transparency and consistency to complex SAP landscapes, leading to increased cost-effectiveness through the harmonization of systems. This pays off in the short term and lasts long-term - be it consolidation or unbundling, upgrades and migrations, documentation of processes and tuning or authorization concepts. Using a comprehensive system analysis, PASA provides information about the functions used, as well as the underlying processes and their use. The result is a meaningful performance indicator system about the actual system usage as well as detailed information about standards and in-house developments. Used programs and transactions are analyzed economically and compared with each other and with current benchmarks. In addition, you will receive automatically generated business process models to represent your individual business processes. As part of the organizational structure, the areas data, processes, and functions are considered. As a delta analysis, this forms the basis for the secure transfer of your processes and functionalities from SAP ECC to the new HANA world. Services are a key success factor for many industries. The efficient, transparent and timely implementation of this process represents a significant competitive advantage. The quality of internal processes such as service entry and billing relieve highly qualified employees of tiresome routine work and speeds up the invoicing process. PASS is a fully integrated SAP standard solution that quickly and efficiently maps project-based service entry and billing. Using a project cockpit, the projects are managed and maintained centrally. The integration of cost and fixed cost scenarios offers a variety of options for mapping the business cases, while the integration of SAP Employee Self-Services offers simple and mobile service entry. Features such as SAP NetWeaver Business Client and an existing SAP NetWeaver Gateway interface provide enhanced connectivity for service entry. A separate care cockpit including various jumps to central functions provide a central and efficient way to manage the business cases. The standard processes of resource-related billing and fixed-price billing, including customer-specific billing layout management, form the core of the billing process step. Extensive reporting provides the necessary transparency to efficiently direct and control projects. The Plaut HANA Quick Check is a modular consulting service which, depending on the customer situation, is combined from several modules. HANA Readyness Check: using various tools, the existing infrastructure and SAP system landscape are analysed and their compatibility for S/4 HANA is checked. Value Assessment: Assistance in determining the economic impact of using S/4 HANA including scenario assessment and business case. HANA roadmap: support in integrating an SAP HANA strategy into your existing strategy, including strategic focus and a well-developed roadmap. PlautMonitoring is a modern and innovative monitoring solution for SAP, Windows and Unix/Linux which is simple to install, individually adaptable and easy to maintain. With PlautMonitoring it is possible to accumulate and filter performance values, alerts and log entries from the CCMS system as well as data from operating systems. It is also possible to analyse them automatically and to respectively react on incidents. While Alertviews allows a quick overview of the SAP scenery it is also possible to gain more detailed information via the integrated portal. With the aid of simple assistants, which allow reacting on changes, service and configuration of the monitors happen. The creation of new templates is simple and is done quickly, but also existing templates can be used. As PlautMonitoring has a modern AJAX web interface which gets along without Plugin’s, no local client is needed. Regarding security there is not only the possibility to restrict the users’ access on certain systems – also single functions can be activated or deactivated selectively. It is thereby ensured that every user gets only the information which is relevant for him. How high are the costs concerning the maintenance of the application landscape towards new projects? How fast are you able to set up new projects? If you are not able to answer these questions immediately, we will support you with pleasure at focusing your valuable IT resources on innovations. Our solutions offer regarding the repatriation to the SAP standard provides the basis for this. In order to meet the special requirements of our customers, we offer non-standardized solutions based on SAP tools. Within this service package, we have prepared many preconfigured development solutions “Plaut Works”. Plaut Works solutions are ready-made SAP system enhancements. Predefined Plaut Works solutions make it possible to reduce as much as possible the time needed to prepare the enhancements. The audit results in an audit report containing conclusions and recommendations regarding the implementation. The scope of services provided by PLAUT includes preparation of solutions around SAP integration with other business partners’ systems and internal systems. We have vast expertise in the implementation of EDI communication between partners and integration of the SAP system with third-party systems handling high-rack storage warehouses. Depending on the client’s needs and preferences, we offer integration services based on various technologies and solutions. Our basic integration platform is SAP NetWeaver. As Value Added Reseller (VAR) Plaut delivers SAP Licenses for midsized companies. Customers benefit from one contract partner for licenses, project implementation and on-going support. Plaut delivers SAP maintenance for on-going support. This includes SAP basis system and application support to ensure trouble-free operation. This service is related to the purchase of the SAP licenses. In our own development center in Romania, nearshore-developments are integrated into the projects, allowing for cost-efficient and competent project implementations. The complexity of a roll-out project with an international character is far higher than the one of a national implementation project. 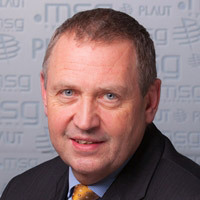 Global harmonization, consolidation of core data and business processes, more efficient design of customer-related order fulfillment, group-comprehensive cross and intercompany processes or the setup of a central, consistent and comprehensive reporting system are just a few examples for the several challenges of an international roll-out project. Process competence is the competence to purposefully analyze processes at different locations, to identify optimisation potentials and to develop inter-site realization concepts. International and scalable solution: An innovative and reliable solution is needed which covers the national and international legal requirements and which is, through a high scalability, just as suitable for large sites and corporate headquarters as it is for smaller offices. With the application of SAP, we offer you a business standard solution which copes with these challenges outstandingly. Roll-out competence: The success of a roll-out project is mainly characterized by the competence of the roll-out partner, the use of well-tried roll-out methods and the availability of a competent, international support. Plaut provides long-term experience gained in numerous successful roll-out projects and a proven template-based roll-out method. Requirement-conform approach to heterogeneity of expectations in the headquarter and the international offices: The approach of an international roll-out requires the analysis of very special, technical-organizational challenges in project work and of socio-emotional problems which occur through a change of structure and procedures for the concerned employees. The business culture of Plaut is medium-sized and international: an important basis for the success of your roll-out project. A SAP upgrade is aimed at a smooth transfer of the currently used system version to a higher version whilst maintaining the standard system functionality and all its enhancements, with guarantee and full safety of all data in the system. We as Plaut have extensive experience in the implementation of projects of this kind. We provide a comprehensive offer, in compliance with the client’s needs. Our offer encompasses the preparation stage for the upgrade, next the technical and functional upgrade, as well as training on differences between SAP system versions and new functionalities.